At Ashbrook Roofing, our extensive selection of roofing products includes everything you need to complete a build. That includes our huge selection of roof windows and skylights, which are perfect for adding that ‘wow’ factor to a building or renovation project. 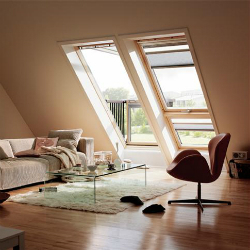 We stock roof windows from the industry’s leading manufacturers, including the likes of VELUX, Roto and RoofLITE. We’re also a leading supplier of the White Painted Roof Windows, which are designed to be even more energy efficient that previous roof windows. To make your project that much easier, we’ve brought everything you need together in the one place. That includes our range of flashing kits for roof windows, which are essential for sealing the joints around the window frame and the roof. We’re happy to share the wealth of experience and knowledge that we’ve built up during our many years of working in the roofing industry. Contact us today for free and impartial advice, as well as product information, to ensure you get the right product for you. Order your roof windows online today at Ashbrook Roofing.